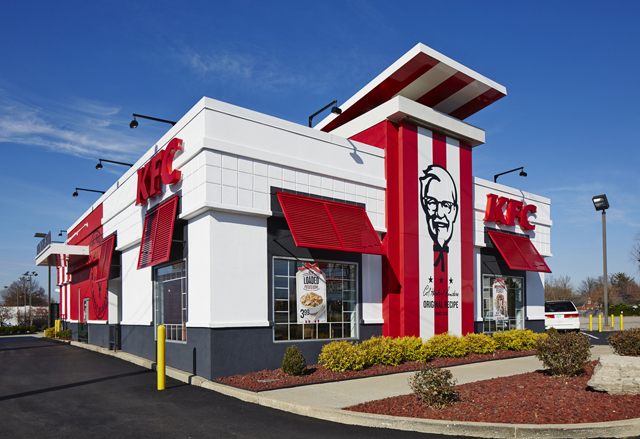 In February of 2015, KFC selected us to be their agency of record. 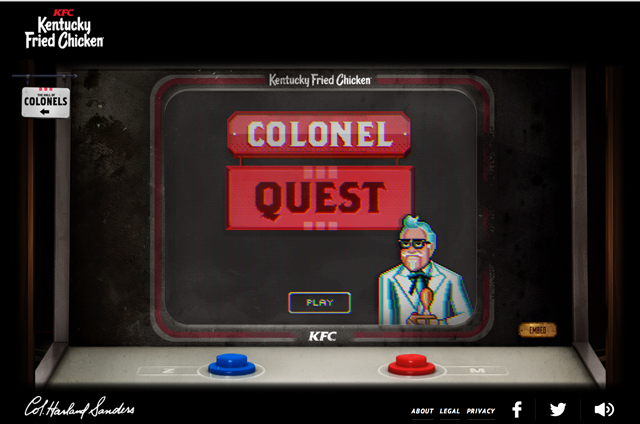 To celebrate the 75th Anniversary of Kentucky Fried Chicken, we brought The Colonel back. 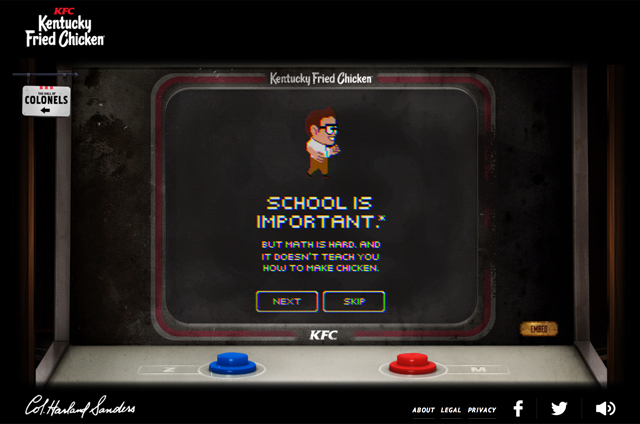 SNL's Darrell Hammond helped us re-introduce Colonel Sanders to America through a new historical web site, television spots, radio ads, new packaging, PR, cinema, a redesigned KFC.com and a gunfight at a gas station. 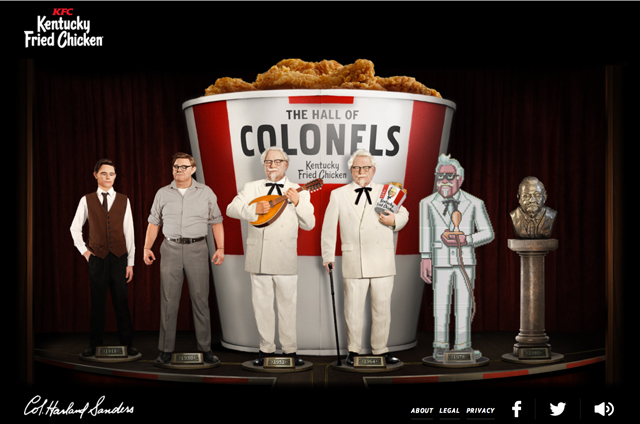 Inspired by the animatronic Colonel Sanders we found in the KFC museum in their Louisville, Kentucky headquarters, we created ColonelSanders.com – an internet encyclopedia featuring the fascinating facts about the fascinating real life of the real man behind the bucket. 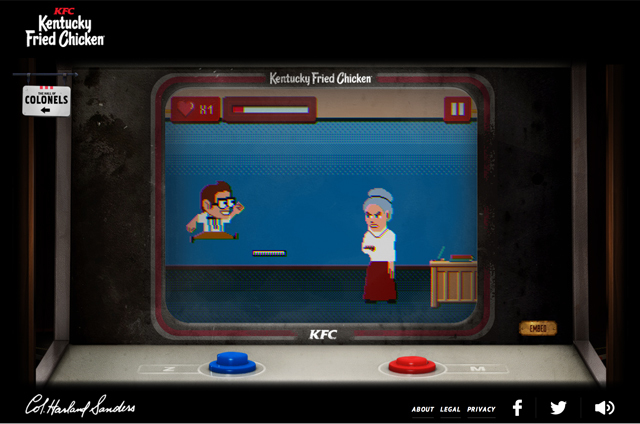 We sent the Colonel Quest video games featured on ColonelSanders.com to influencers in this custom 8-bit bucket that housed two Wii-like USB drumstick controllers. 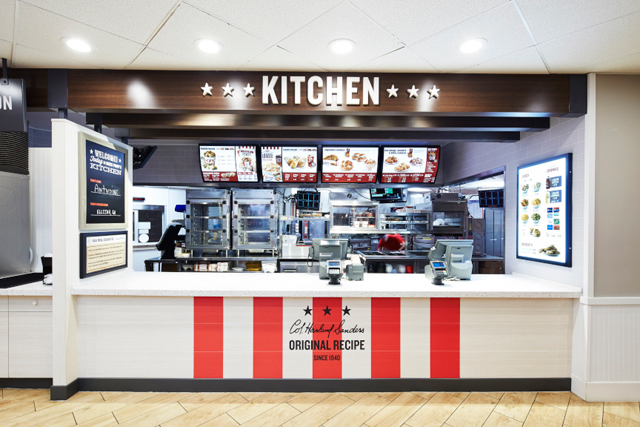 We worked with KFC and Redcactus on new packaging that nodded to KFC's heritage and helped concept a new look for a nationwide refresh of all their restaurants. We made some more commercials. The Colonel's missed some of the goings-on in baseball of late. 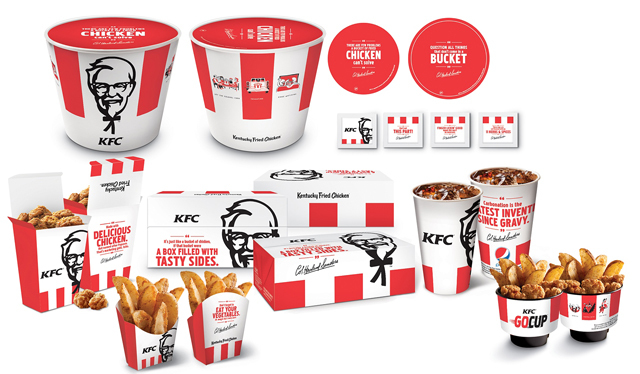 We sent some gifts to folks who've been vocal and forthright with their love KFC. 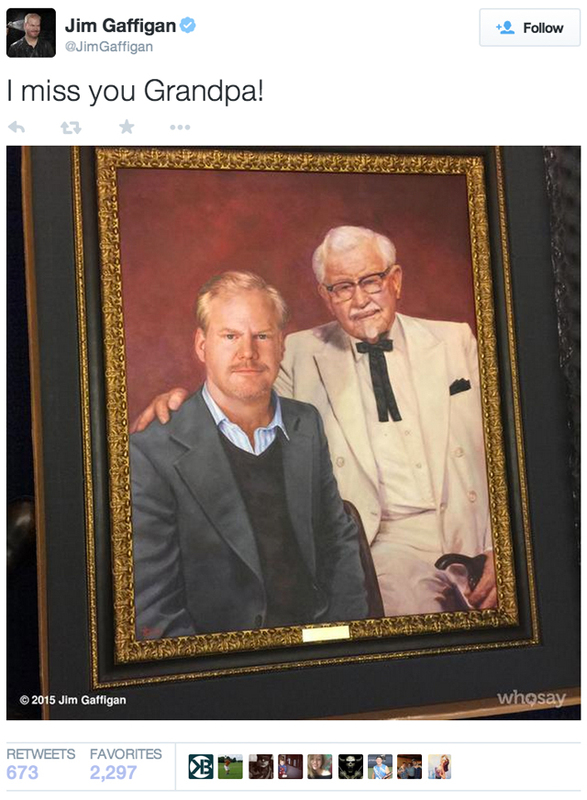 Jim Gaffigan seemed to appreciate his. What did he know that we didn't? 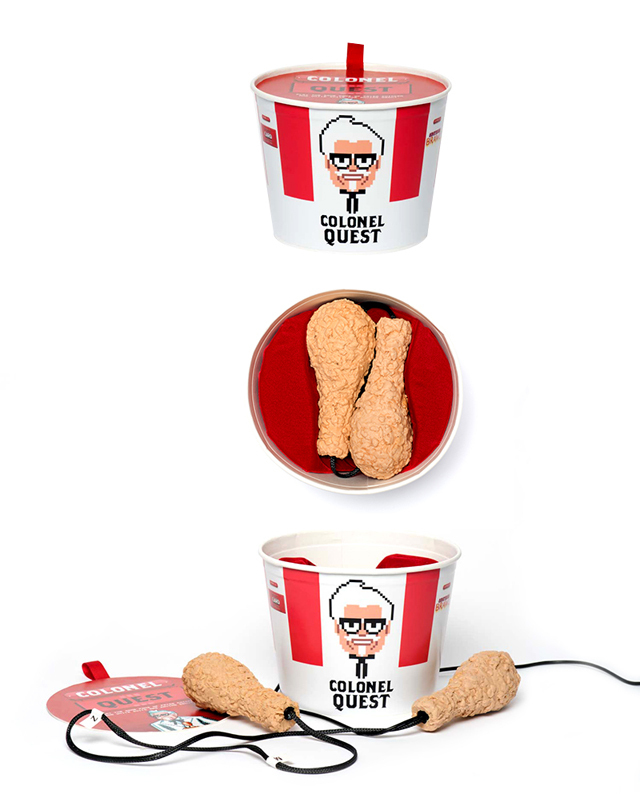 We had The Colonel take over KFC's Twitter account and post his first Tweet, which was actually 18 Tweets long, because he even does social media "The Hard Way." 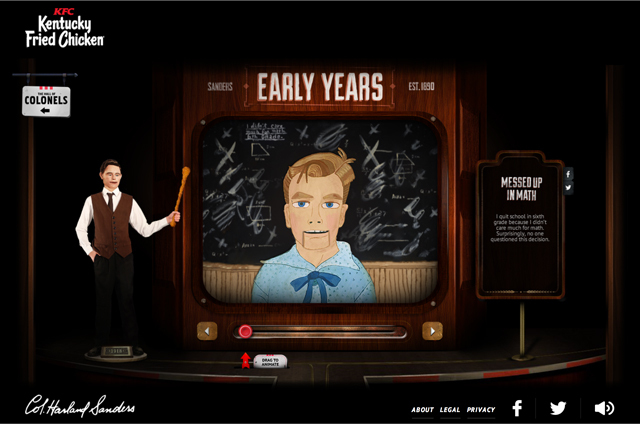 We also made a play about that one time The Colonel shot a guy. 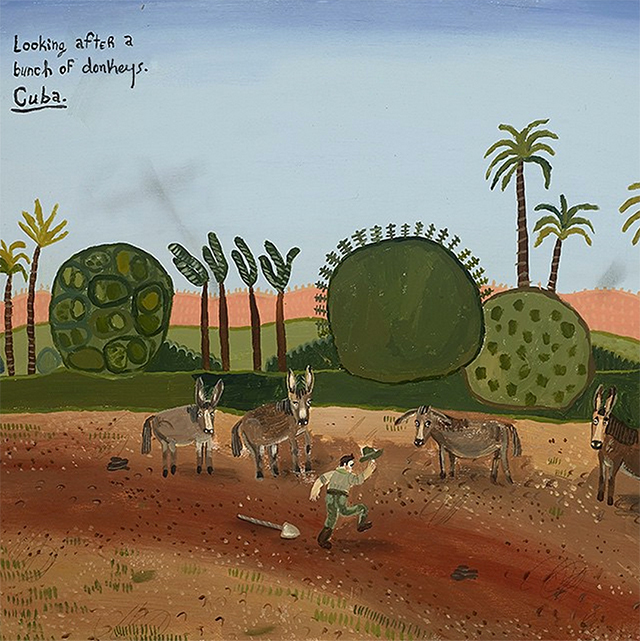 And we got to make some great illustrations about the Colonel's life before he was a Colonel. The launch was covered in BuzzFeed, Details, Vice, Barstool Sports, CNBC, Fortune, People, The Daily Mail, Fast Company, The NY Post, Creativity, AdWeek, AgencySpy, and Ad Age and Ad Age again. Campaign creatives: Matt Mulvey, Lawrence Melilli & Jeff Williams along with Matthew Carroll, Claire Wyckoff & Shaine Edwards who lead ColonelSanders.com and Jon Marshall, Jason Turner, Joe Albert, Darcie Burrell & Heather Ryder who helped round out the campaign with social, packaging and in-store work.